In teaching, and we've all been to school - the teacher will plan a lesson, deliver that lesson, mark the books - have a think to reflect on what has been learned and repeat the cycle again and again. And will only stop when the student has looked and listened, done things, practised them, made mistakes and practised again. Eventually, they would have exploited their knowledge, remembered it all, to such a high level - they will never forget. In the YouTube Creator Playbook Version 4 on page 54, there is a slide on how, Videos with low audience retention are far less likely to be surfaced in Search. This post has a series of steps that outline what you can learn from the Audience Retention % (once you have found it that is). It will then refer you to one of 62 slides that I've made based on my own channel's data. This will give you an idea of what each percentage looks like - how it visualises and what we can learn. If you are are doing well, then celebrate. If not, stop holding your head in your hands, stop saying OMG and evaluate to improve. If you are not a creator, then you can still look and learn to dispel the myths that surround many popular channels. For there are many examples of high views, yet an embarrassing low retention. And I will say now - every creator I've posted to, not one of them have come back and said, OMG How can I do better? The cynic in me may say, they are far too busy chasing views to really think about audience retention. Let's be open about it, if they 301 in an hour, that's an ego boost. If they hit 20k views in a day, they're happy. But, if they could of done it all just like that, but with 80% less effort - that's what sounds smart to me. Which begs my top four questions..
What is a fair Audience Retention %? What is an fair video length? What is a fair way to study just one video compared to research into a whole channel or playlist? That's to say 50% of a 10 min is NOT the same as 50% of a 30 sec video. Step Six, part ii - If you are not the channel owner, refer to one of the 62 slides I have prepared. This will help you to visualise what 1, 5, 10, 25, 50, 75, or 100% Audience Retention could actually look like. And this is the whole point of this post, what it could look like. 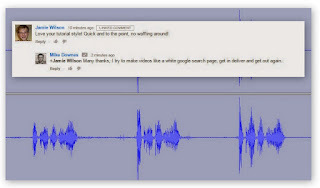 One important Point - The Average View Duration leads us to the Audience Retention Percentage (%) - this maybe the YouTube engineers way of saying, We have done loads of percentage maths for every split second of this video and we have therefore calculated a percentage - but we are going to convert that percentage to a time, maybe as it looks better that way. For example, for a video of length of 1 mins 23 secs (83 secs) with an average view duration of 38 secs, the audience retention will be 83 x 46% = 38 secs. The line chart may look like this, where we can see 100% at the start and a steady drop off to about 30% at the end. The question must be - what did I do to make 70% of the people leave my video? 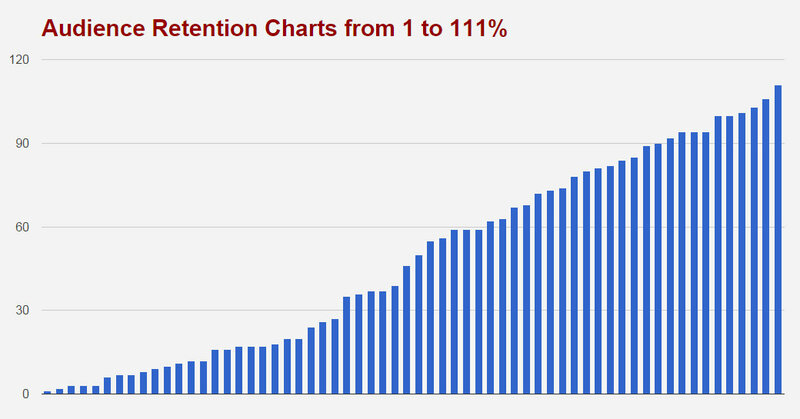 Step Seven from my studies so far, each video starts with 105% retention and ends with an average retention of 32%. 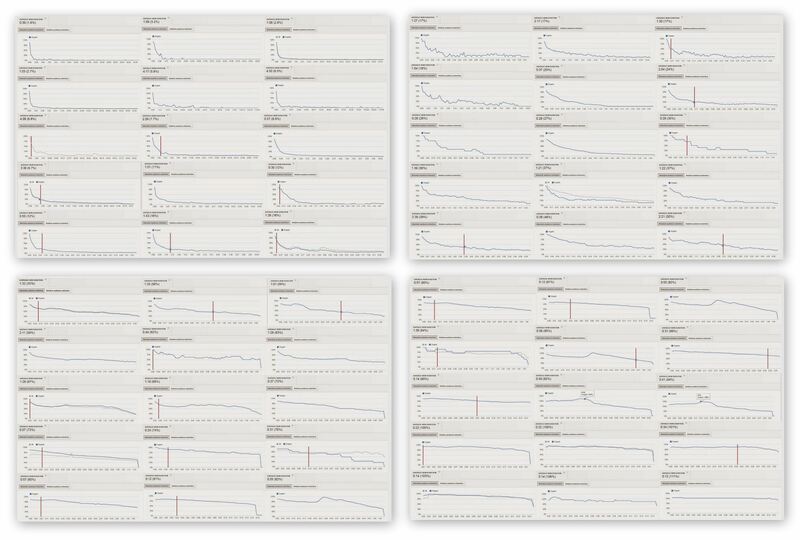 What that means in practice, I've looked at over 250 of my videos and looked at the start and end percentages, made a sheet and done some math. I was taught in teacher something about classroom control - it said, at the start of every lesson, you have control, all you can do is lose it. In practice with a room full of seven year olds, it's a matter of leading them through your lesson, making sure they have something to do, making sure they can find everything and making sure each and every one of them is engaged and learning. For children at a range of abilities, the teacher would have to differentiate each lesson into maybe 3 to 6 levels. 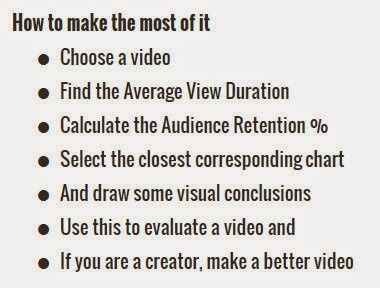 The same could be true if making videos and retaining an audience. In movie terms, that's why a three year old laughs at Monsters Inc or Toy Story, yet the adults love it too.